Both parts in this step use the ConfiguratorA network (displayed below), just as in the previous steps. In this part we will override the routes going from the subnet of router0 to host7. With the automatic configuration, packets from router0’s subnet would go through router2 to reach host7 (as in the previous step.) We want them to go through router1 instead. description = "Manually overriding individual routes - route to a specific host"
A ping application is added to host0, in addition to the one in host1 added in Step 4. The new app in host0 pings host6 to demonstrate that only packets sent to host7 are affected by the route override. The <route> element describes a routing table entry for one or more nodes in the network. The hosts optional selector attribute specifies which hosts’ routing tables should be affected. There are five additional optional parameter attributes. These are the same as in real life routing tables: address, netmask, gateway, interface, metric. The <route> element in this XML configuration adds the following rule to router0’s routing table: Packets with the destination of 10.0.0.35/32 should use the interface eth1 and the gateway 10.0.0.18 (router1.) The concrete IP addresses were obtained by setting up the network without the <route> element first, and inspecting the result. First, note that adding a route manually does not erase the original route. 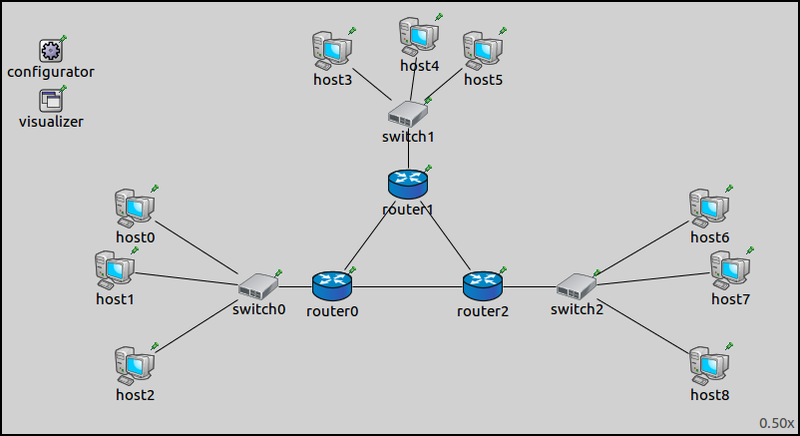 Therefore, the new route will only take effect if it is “stronger” than the automatically added one, for example it has longer matching prefix, better metric, or (given the previous ones are equal) occurs earlier in the routing table. Luckily, the last condition usually holds (manually added routes are added at the top), so manually added routes do take effect unless they are explicitly weaker than the original ones. Second, note that the <route> element refers to addresses (e.g. 10.0.0.35) which were automatically assigned by the <interface> element. It is valid to do so because the assigment of IP addresses is deterministic, that is, given the same input, it will always produce the same result. However, if you change the network topology, for example add, remove or reorder hosts, addresses might be assigned in a different way. The consequence may be that addresses in the <route> element no longer exist in the modified network or they refer to different hosts/routers than originally intended, i.e. the configuration will silently break. One solution to make the configuration more robust is to explicitly assign the addresses in question, using extra <interface> elements. (Note however, that adding an <interface> element might also affect the automatically assigned addresses, so it makes sense to add all <interface> rules together at once, instead of one-by-one.) Another solution would be to let <route> elements refer to addresses symbolically, i.e. be able to formally express “the address of router1’s interface that faces router0” instead of spelling out “10.0.0.18”. However, support for such mini-language has not yet been added to the configurator. The routing table of router0 in the previous step had six entries. Now it has seven, as the rule specified in the XML configuration has been added (highlighted). This and the second to last rule both match packets to host7, but the manually added route takes effect because it has a longer netmask (plus it’s also earlier in the table). The following animation depicts host1 pinging host7, and host0 pinging host6. Routes to host7 are visualized. Note that only routes towards host7 are diverted at router0. The ping reply packet uses the original route between router0 and router2. Ping packets to host6 (and back) also use the original route. In this part, we will override routes going from the subnet of hosts 0–2 to the subnet of hosts 6–8. These routes will go through router1, just as in Part A.
description = "Manually overriding individual routes - route to a set of hosts"
The <route> element specifies a routing table entry for router0. The destination is 10.0.0.32 with netmask 255.255.255.248, which designates the addresses of hosts 6–8. The gateway is router1’s address, the interface is the one connected towards router1 (eth1). This rule is added to router0’s routing table in addition to the rule added automatically by the configurator. They match the same packets, but the parameters are different (see at the result section below.) The manually added routes come before the automatic ones in routing tables, their prefix length and metrics are the same; thus, the manual ones take precedence. The following is the animation of host1 pinging host7 and host0 pinging host6, similarly to Part A. Routes to host7 are visualized. This time both packets destined to hosts 6 and 7 take the diverted route, and the replies come back on the original route.